Are Healthy Snack Boxes Suitable for Those with Dietary and Allergy Needs? The answer to this question is most definitely yes! Read on to discover why your place of work should consider Snack Boxes and how you can be sure everyone will be able to enjoy something to eat, whatever their dietary requirements. You’re sure to come across people with a range of different food preferences and intolerances whether in your work or personal life. But do you know the difference between a person who is lactose intolerant, another who has a milk allergy, and somebody else who has coeliac disease? We’ve collated this guide to help you understand a bit more; when the mid-afternoon slump hits, you’ll know exactly what you can offer them for a snack. Let’s start with one of the most recognised dietary preferences in the world. A vegetarian is a person who doesn’t eat meat or any foods which contain ingredients that are derived from the slaughter of animals. People may be vegetarian for ethical or religious reasons, or they may choose to become vegetarian because they can’t bear the thought of eating food made from a living animal. Some people become vegetarian to benefit their health or for the good of the environment. Environmental concerns centre around the impact we are having on the planet by using the Earth’s water, land and resources to breed animals for humans to consume. Livestock production accounts for nearly 80 per cent of greenhouse emissions from agriculture worldwide; this alarming statistic might be enough to persuade an environmentally conscious person to ditch the meat. Since vegetarians don’t eat meat, they need to plan their diet to ensure they are getting all the essential nutrients. In particular, vegetarians need to include the following in their diet: protein, minerals, vitamin B12, and vitamin D. Snack Boxes from Snackwize contain bars and balls packed with nutrition and protein. Any vegetarians in the office can boost their protein intake by opting for one of these for their mid-morning snack. Vegans do not eat meat, fish, dairy, eggs and honey, and they avoid products that are made from leather or tested on animals. Like vegetarians, many vegans choose to follow a plant-based diet in order to reject the exploitation of animals. Some feel so strongly about animal welfare and cruelty that they refuse to visit zoos or aquariums, wear clothes that are made from any animal products, or use cosmetics or household items that involve the exploitation or use of animals at any stage in the production process. Around 2.1 million Australians follow a 100 per cent plant-based diet, which is roughly 8.7 per cent of the population. As well as fruit and vegetables, vegans can eat nuts, grains, seeds, beans and pulses. There is also a wide range of specially-made vegan meat substitutes available. Many foods can be made to be vegan by using plant-based ingredients instead of ingredients that are animal-based. Options include curry, pizza, and cheese, and just about anything else you can think of. Although in the past vegans may have been restricted when it came to tasty food options, nowadays many chefs, eateries and restaurants make delicious vegan cuisine their speciality. What is a Cow’s Milk Allergy? People who are allergic to cow’s milk are usually also allergic to other dairy food as well. Their reaction can range in severity. In a mild or moderate reaction, a person allergic to cow’s milk might notice swelling of the lips, face or eyes. They may also suffer from stomach pain, vomiting or diarrhoea. In a severe allergic reaction, or anaphylaxis, a person can suffer swelling of their tongue or throat and even a loss of consciousness. Anaphylaxis is a medical emergency that requires immediate treatment with adrenaline. It can also be possible to have a delayed allergic reaction to cow’s milk. Symptoms can include eczema, vomiting and diarrhoea. People who are allergic to cow’s milk will probably be allergic to other animal’s milk, such as goat’s milk, as well as any products that are made with animal-derived milk. Some people with a milk allergy can tolerate cakes and biscuits that are made with milk. Lactose intolerance is different from an allergy to milk. This is when the body doesn’t produce enough lactase, an enzyme which is found in the small intestine. Your body needs lactase to digest the naturally occurring sugar in milk, which is called lactose. People who are unable to digest lactose because of an insufficient amount of lactase might suffer from symptoms which include stomach pain, gas, bloating, vomiting or diarrhoea. Most people with lactose intolerance can eat cheese, especially hard cheese because it doesn’t contain any lactose. Small amounts of lactose are often tolerated, so milk, yoghurt and butter might be OK.
Gluten intolerance, or coeliac disease, is an autoimmune disease. It is caused when the immune system reacts abnormally to gluten, which is a protein found in wheat, rye, barley and oats. The symptoms of coeliac disease include bloating, diarrhoea, abdominal pain, headaches, skin problems, tiredness, and depression. A person with coeliac disease might also suffer from weight loss or a struggle to gain weight. People with coeliac disease are born with a genetic predisposition to it, and it is not an allergy. On average, approximately one in 70 Australians are affected, but around 80 per cent of these people remain undiagnosed. If a person has coeliac disease, they need to eat a strict gluten-free diet. Foods that contain wheat, rye, barley and oats cannot be consumed, so pasta, bread and crackers are out of the question - unless they are certified as gluten-free. At Snackwize, we take care to include a selection of gluten-free snacks in our healthy snack line-up. If you have a number of people at work who need gluten-free food choices, let us know. We can customise your Snack Box with more tasty, gluten-free snacks, such as Harvest Snaps Snack Crisps which are made from peas, beans, lentils and legumes. That means convenient, full-sized single portions of a delicious snack that is healthy and gluten-free. A nut allergy is an allergy to peanuts, an allergy to one or more other kinds of tree nuts, or an allergy to both. People can be allergic to one specific type of tree nut but often, if they are allergic to one type of tree nut, they are allergic to multiple different types. Tree nuts include pistachios, brazil nuts, pine nuts, chestnuts, hazelnuts, macadamia nuts, almonds, walnuts, pecans, cashews, and more. Peanuts are among the most common allergy-causing foods. Peanuts are legumes, and so are biologically unrelated to tree nuts, but symptoms of an allergic reaction can be just as serious. A person with a nut allergy who consumes or comes into contact with nuts or nut oil might need urgent medical help. Symptoms of a nut allergy can include skin reactions, nausea, stomach pain, vomiting and diarrhoea, and more serious problems with the airways. Serious symptoms include swelling of the lips, tongue or face, and anaphylaxis. This is a medical emergency and the person needs to be treated by a medical professional as soon as possible. Peanuts and nuts often find their way into things you wouldn’t expect, which can make life difficult for someone with a severe nut allergy. Even if a person is only allergic to one kind of nut, they might choose to avoid nuts altogether, or avoid products made in factories or processing plants where nuts are handled. This is because unintentional exposure to nuts might occur due to cross-contamination. Collating tasty snacks that will appeal to everyone and suit different dietary requirements can be time-consuming, expensive and a real hassle. That’s where Snackwize comes in. We can customise your Snack Box so you can rest assured you have catered for everyone, even those with nut allergies. We have hundreds of different healthy snacks from more than 100 premium brands, so the snacks you offer need not ever be boring. Paleo simply means ‘old’. Also known as Primal, Caveman and Stone Age, a paleo diet focuses on what human beings have evolved to eat. By only consuming what our bodies can cope with naturally, proponents of a paleo diet say we can achieve optimal health by controlling insulin sensitivity, repairing gut health, increasing our body’s ability to absorb nutrients, and reducing the effects of inflammation. So, since our ancestors ate whole, unprocessed foods, a paleo diet mirrors this. Ingredients include fresh food, grass-fed meat, free-range poultry, wild fish, fruit, vegetables, berries, nuts and seeds. Followers of a paleo diet avoid grains, legumes, refined sugars, and in some cases, dairy. 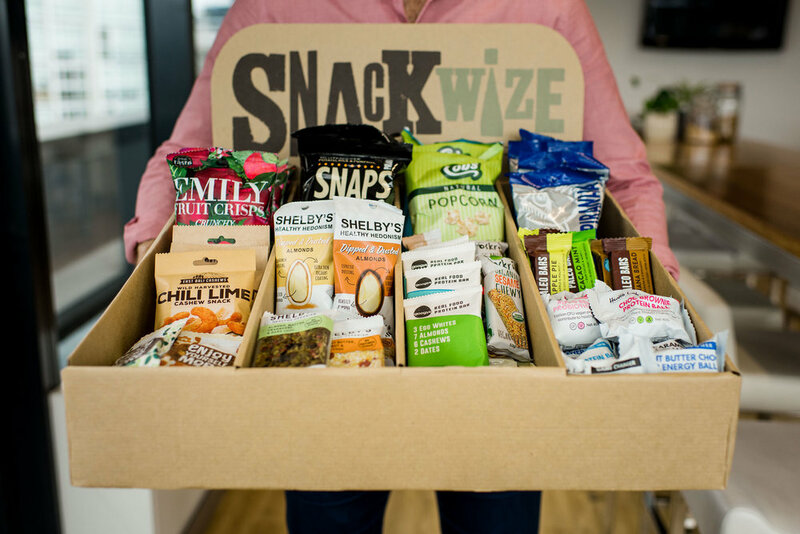 If you’re wondering what snacks to include for a colleague who is following a paleo diet, you can trust Snackwize to take care of this dilemma for you. By including paleo diet-friendly options in our Snack Boxes, we make it easy for those following a paleo diet to reach out and enjoy a snack when they’re feeling peckish during the working day. GMOs are genetically modified organisms which are created in a laboratory using genetic engineering. Genetic engineering is the process of inserting genes into the DNA of a food plant to improve it. Some people feel that there are health and environmental risks associated with the consumption of these foods, and so choose not to consume them. Non-GMO snacks are those that do not contain any genetically modified organisms. People that are passionate about a non-GMO diet might avoid processed foods, or choose organic foods because genetically modified substances are not permitted in organic production. They might like to grow their own fruits, vegetables, plants and flowers to source their own natural food and ingredients. Now you know the difference between a food intolerance and an allergy, and a dietary requirement and a food preference, you can be better prepared to cater for everyone. If you’re interested in ordering a Snack Box for your place of work, contact us. By having a Snack Box delivered to your place of work you can be sure that you have the right food items for everyone, be they employee or guest, whatever their dietary requirements or preference. How Can Employers Encourage Health and Wellbeing at Work?